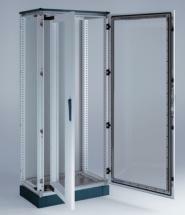 3HE to 21HE 19” rack enclosures with 450 to 550mm depths. Available with punched or bland panels and ventilation accessories. CE-TEK manufacture a range of 19″ rack and network mounting solutions. Using our CE-1000 cabinet and plinth range, we can offer full or partial height 19″ rack frames with 90º or 180º opening. Our 19″ rack components allow a full range of options, which are suitable for heavy load fixing, fixed (>70 kg), removable and sliding shelves (>40 kg). Other options include ventilation grills, shelf fans, ventilated door, cable guides and many more.